Snake charming refers to the practice of hypnotizing a snake by playing an instrument. A typical performance may also include handling the snakes or performing other dangerous acts, as well as other street performance staples, like juggling and sleight of hand. The practice occurs most commonly in India, though other Asian nations such as Pakistan, Bangladesh, Sri Lanka, Thailand, and Malaysia also harbor performers, as well as the North African countries of Egypt, Morocco, and Tunisia. The snake charmer plays the role of hero, able to control the snake personifying evil, even the devil or Satan. The snake, in the great monotheistic traditions of Judaism, Christianity, and Islam has been viewed as a personification of evil arising from the mythological story of the Fall, in Genesis. 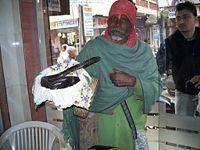 The snake charmer in India, although cast in the role of hero and shaman priest in traditional India, has become more like a vaudeville sideshow for the curious, as people have become more aware of the snake as a creature rather than a spiritual being of evil. Ancient Egypt served as home to one form of snake charming, though the practice as it exists today likely arose in India, eventually spreading throughout Southeast Asia, the Middle East, and North Africa. Despite a sort of golden age in the twentieth century, the practice of snake charming has been dying out, mainly due to the recent enforcement of a 1972 law in India banning ownership of serpents. In retaliation, snake charmers have organized in recent years, protesting the loss of their only means of livelihood, and the government has made some concessions to them. Many snake charmers live a wandering existence, visiting towns and villages on market days and during festivals. With a few rare exceptions, they typically make every effort to keep themselves from harm's way. For one, the charmer typically sits out of biting range, his reptile sluggish and reluctant to attack anyway. More drastic means of protection include removing the creature's fangs or venom glands, or even sewing the snake's mouth shut. Those snake's native to the charmer's home region, typically various kinds of cobras, though vipers and other types, represent the most popular species used. Though serpents have featured prominently in humankind's religions for centuries, the earliest evidence for snake charming comes from Ancient Egyptian sources. Charmers in Egypt mainly acted as magicians and healers. As literate and high-status men, part of their studies involved learning the various types of snake, which gods held them sacred, and how to treat reptile bites. Part of their repertoire included entertainment; they knew how to handle the animals and charm them for their patrons. 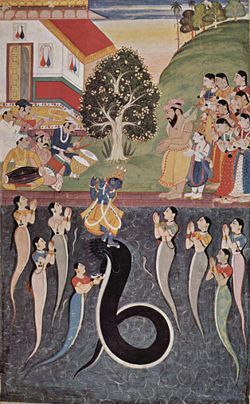 Snakes have long been popular subjects of Hindu art. Snake charming, as it exists today, probably originated in India. Hinduism has long held serpents sacred; the Nagas relate to the reptiles. In pictures, the cobra sits poised ready to protect many of the gods. By inference, traditionally Indians tend to consider snake charmers holy men influenced by the gods. Traditional healers most likely practiced the earliest form of snake charming. As part of their training, they learned to treat snakebite. Many also learned proper snake handling techniques, and people called on them to remove serpents from their homes. Baba Gulabgir (or Gulabgarnath) became their Guru, since his legend states that he taught people to revere the reptiles, not fear them. The practice eventually spread to nearby regions, ultimately reaching North Africa and Southeast Asia. The early twentieth century proved something of a golden age for snake charmers. Governments promoted the practice to draw tourism, snake charmers often traveling overseas to perform at cultural festivals and for private patrons. In addition, the charmers provided a valuable source of snake venom for creating antivenins. Today, the number of practicing snake charmers remains undetermined in India; although the practice appears to be dying out. One reason has been the growing numbers of people in India with cable television; nature documentaries have alleviated much of the fear and revulsion once felt toward snakes, demystifying the snake charmer skill. Many people have less spare time, especially children, who in previous decades could watch a charmer all day with no commitments to school. Animal-rights groups have made an impact by decrying what they deem abuse of a number of endangered species. Urbanization and deforestation have made the snakes, upon which the charmers rely, increasingly rare. That, in turn, has given rise to the single most important reason for the decline of snake charming, at least in India: The practice has become illegal. India passed the Wildlife Protection Act in 1972. The law, originally aimed at preventing the export of snake skins, introducing a seven-year prison term for owning or selling of the creatures. 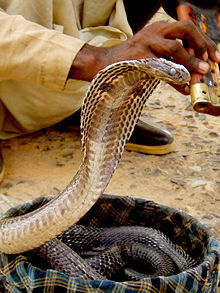 Beginning in the late 1990s, animal-rights groups convinced the government to enforce the law with regard to snake charmers as well. As a result, the charmers moved their performances to less-traveled areas, such as small villages, or paid hefty bribes when caught by police officers. The trade brings little revenue to the snake charmer in recent years and many practitioners must supplement their income by begging, scavenging, or working as day laborers. 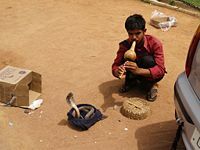 Children of snake charmers increasingly decide to leave the profession to pursue higher-paying work, many fathers agreeing with their decision. Modern Indians often view snake charmers as little more than beggars. Recently, the snake charmers have struck back. In 2003, hundreds of them gathered at the temple of Charkhi Dadri in Haryana to bring international attention to their plight. In December of the following year, a group of snake charmers actually stormed the legislature of the Indian state of Orissa with their demands, all the while brandishing their animals. The Indian government and various animal-rights groups have now acknowledged the problem. Retraining the performers as snake caretakers and educators has been proposed in government. In return, they could sell their traditional medicines as souvenirs. Another proposal would focus attention on the snake charmer's music; the charmer would be like other street musicians. The Indian government has also begun allowing a limited number of snake charmers to perform at specified tourist sites. Snake charmers typically walk the streets holding their serpents in baskets or pots hanging from a bamboo pole slung over the shoulder. Charmers cover those containers with cloths between performances. Dress in India, Pakistan and neighboring countries remains generally the same: Long hair, a white turban, earrings, and necklaces of shells or beads. Once the performer finds a satisfactory location to set up, he sets his pots and baskets about him (often with the help of a team of assistants, who may be his apprentices) and sits cross-legged on the ground in front of a closed pot or basket. He removes the lid, then begins playing a flute-like instrument made from a gourd, known as a been, or pungi. As if drawn by the tune, a snake eventually emerges from the container; if a cobra, it may even extend its hood. The reptile then begins swaying to and fro in time with the musician's tune, apparently hypnotized. The snake never strikes, and the charmer may go as far as kissing the creature on the head. Amazed onlookers throw coins and notes to the successful performer. Eventually, as if on cue, the snake returns to its container, the charmer replaces the lid, and he gathers up his earnings. Alternatively, the charmer may handle his animals, daring his audience to touch them. Almost no one does. Once he has earned all he can from his current viewers, he moves on to perform somewhere else. In reality, standing erect and extending the hood constitutes a normal defensive reaction for a cobra and simply indicates the snake's startled reaction to losing its darkened environment. Charmers may even wave their instrument discretely, without arousing audience attention, over the opening to prompt the creature to emerge. As for the snake's swaying movement, it is actually a reaction to the movement of the performer's instrument and sometimes the tapping of his foot. The animal lacks the capacity to hear the tune being played, though it can perhaps feel some of the sound vibrations as well as those from any tapping by the charmer. The serpent's timid nature explains its evident reluctance to attack; snakes prefer to scare off possible predators rather than fight them. Most snake charmers reduce the chances of a bite even further by sitting just out of striking range (about one-third of a cobra's body length). Even kissing the creature may be accomplished without much danger, as cobras lack the capability of attacking things above them. Though some claim that snake charmers drug the animals, that rarely, if ever, occurs. In addition, many snake charmers learn to read their animals and can tell when they prepare to strike. In a worst-case scenario, most snake charmers know at least rudimentary methods of treating snakebite. The charmer stopping his waving motion causes snake to return to its container. Some content that the reptile's receptacle plays a part, keeping the snake's blood temperature down and the animal groggy, although that may represent folklore more than scientific fact. Charmers often supplement their performances with juggling, sleight of hand, and other tricks. "Turning a rod into a serpent," a trick that has been known since Biblical times (see Exodus 7:12), represents one stunt. Putting pressure on a particular nerve behind the snake's head, causing it to stiffen up, has been forwarded as one explanation. Sometimes charmers stage mock combats between their snakes and other animals, such as mongooses. North African snake charmers usually set up battery-powered loudspeakers with which they advertise a wide array of charms, medicines, and health care pamphlets. They may also demand exorbitant fees from hapless tourists who snap photographs of them. First, a would-be snake charmer must get a snake. Traditionally, the aspirant accomplished that not too difficult a task by going out into the wilderness and capturing one. Most South Asian and North African snakes tend to be slow movers. The exercise also teaches the hunter how to handle the wild reptiles. Today, increasing numbers of charmers buy their animals from snake dealers. A typical charmer takes in about seven reptiles per year. The exact species of serpents used varies by region. In India, charmers prefer the Indian cobra, though some may also use Russell's vipers. Indian and Burmese pythons, and even Mangrove Snakes have been used on occasion, though less popular. In North Africa, the Egyptian cobra, puff adder, carpet viper, and horned desert viper commonly star in performances. Except for the pythons, all of those species carry highly venomous poison. At home, snake charmers keep their animals in containers such as baskets, boxes, pots, or sacks. They must then train the creatures before bringing them out into public. For those charmers who allow their pets to keep their fangs, the training may include introducing the snake to a hard object similar to the punji. The snake supposedly learns that striking the object only causes pain. Charmers reportedly provide poor care, at best, to performing serpents. In an effort to remove any danger from their performances, snake charmers routinely de-fang their animals or remove their venom glands. In an even more severe technique, they sew the creature's mouth shut, leaving only a small opening through which its tongue may flick in and out (the stitches can be removed for periodic feedings). In an even more extreme measure, the charmer removes reptile's jawbone and the venom glands with it. Those methods often cause infection and lead to the snake's death. Charmer's feeding methods fare just as poorly. Some snake charmers give their creatures only milk, which the snakes lack the capability to digest (though some sources claim the practice a myth). Others feed them leaves and herbs thought to cause the snakes to become lethargic and confused. Still others starve them, simply finding new snakes to replace those that die. Animal-rights groups report an average lifespan of six months for a performing snake. Steve Irwin had also stated such ideas, saying that the snakes will slowly die after de-fanged. Additionally, he had said that to the viewers to "Never stop and pay money to these people (snake charmers)." That said, a few snake charmers treat their animals quite well, feeding them properly and handling them without maiming them in any way. Some performers seem to have an uncanny rapport with their snakes, the reptiles seeming almost tame. Those charmers may even learn rudimentary veterinary medicine. Snake charmers typically inherit their profession. Most would-be charmers thus begin learning the practice at a young age from their fathers. 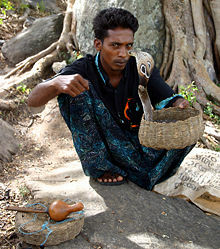 Part of that results from India's caste system; as members of the Sapera or Sapuakela castes, snake charmers have little other choice of profession. Entire settlements of snake charmers and their families exist in some parts of India and neighboring countries. In Bangladesh, snake charmers typically belong to the Bedey ethnic group. They tend to live by rivers, boating to towns along the rivers on market days and during festivals. North African charmers usually set up in open-air markets and souks for their performances. Their trade primarily aims at the tourist market, so they tend to work in resort towns and near large hotels. In previous eras, snake charming constituted the charmer's only source of income. Less true today, many charmers also scavenge, scrounge, sell items such as amulets and jewelry, or perform at private parties to make a surviving income. People often regard snake charmers as traditional healers and magicians, as well, especially in rural areas. Those charmers concoct and sell all manner of potions and unguents that purportedly do anything from curing the common cold to raising the dead. They also act as a sort of pest control, as villagers and city-dwellers alike call on them to rid homes of snakes (though some accuse snake charmers of releasing their own animals to receive the fee for simply catching them again). "Asia—India—A Bid to Ban Snake-Charming." The Economist. 374, no. 8407: 46. Bagla, Pallava. India's Snake Charmers Fade, Blaming Eco-Laws, TV. National Geographic News. Retrieved January 28, 2008. Bose, Derek. Snake Charmers of India. The Tribute. Retrieved January 28, 2008. "Charming." December 29, 2004. The Economist. Coomber, Steve. 2006. "Snake Charming." Business Strategy Review. 17, no. 4: 32-37. Houlihan, Patrick F. Spellbound: Charming the Snake & Scorpion. Ancient Egypt Magazine. Retrieved January 29, 2008. Highfield, Andy C. and Bayley, Jane R. "Folklore, Myth, and Exploitation of snakes in Morocco and Tunisia." Tortoisetrust.org. Lawson, Alastair (6 February 2003). "Snake charmers fight for survival." BBC News. This page was last modified on 25 September 2015, at 15:19.